Unfortunately, as your furry friend starts to age, he begins to lose vigor and has trouble moving around. If your dog moves around lazily and likes to take naps instead of playing, he could be suffering from joint problems or worse, arthritis. Watching your dog suffer from mobility problems can be a heartbreaking experience for any pet owner. Fortunately, you can get your canine friend up and moving again by investing in supplement tablets. However, with so many supplements on the market, choosing the right one can be a daunting task. Nutramax Dasuquin Chewable Tablets are joint health supplements that can help your dog get up and moving again. The tablets are made with ASU, short for avocado/soybean unsaponifiables, an ingredient derived from soybeans and avocados that promotes good joint health. The ingredient has proven to improve joint function and increase comfort level in dogs suffering from arthritis. 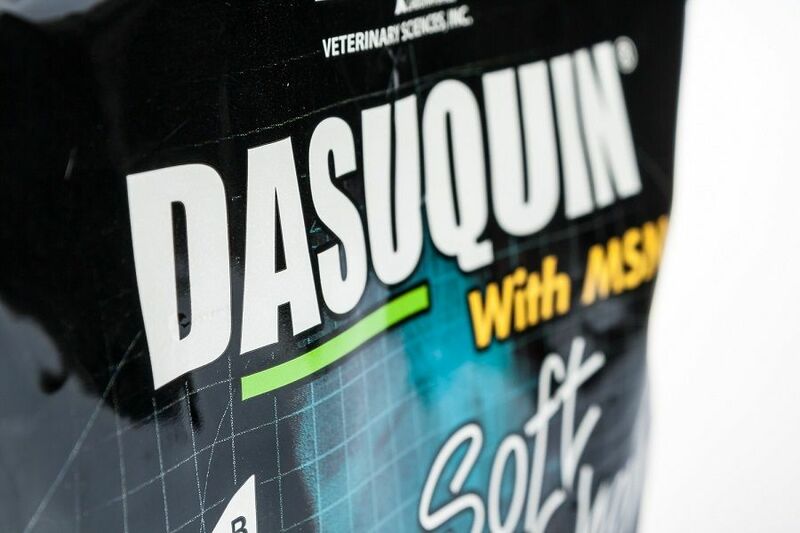 #1 Recommended Brand by Vets - There are several benefits associated with Dasuquin, including its ability to provide relief to dogs suffering from arthritis. As your furry friend starts to age, his joints and cartilages are likely to wear down just like humans. This particular supplement is known to reduce the effects of joint pain and is a #1 recommended brand by vets. Reduces Joint Pain - While joint pain can be almost unnoticeable or mild for some dogs, it can be crippling for other pets. Keep in mind that not all pets are likely to respond to pain in the same way, which is why you should invest in a high-quality supplement, such as Nutramax Dasuquin for your dog. Clinically Proven - The product has been formulated after more than 10 years of clinical study and research. The product contains active ingredients, such as decaffeinated tea, hydrochloride, and NMX1000 ASU among others. All these chemicals combine to offer the most comprehensive joint management formula in the market. These ingredients are highly effective and are clinically proven to offer notable benefits for your dog’s health. Easy to Administer - Pet owners will be relieved to learn that Nutramax Dasuquin Chewable Tablets are easy to administer. The chewable tablets are quite delicious, making them highly popular among dogs. Approved for Cat and Dogs - Some pet owners will be happy to know that the supplement is approved for both cats and dogs. Since the supplement has been manufactured using natural ingredients, it has minimal side effects though it may result in certain gastrointestinal problems in pets. For Multiple Dog Sizes - Nutramax Dasuquin Chewable Tablets is available for two sizes: small and medium. The two sizes are for dogs that weigh less than 60lbs or large dogs that weigh over 60 lbs. Nutramax Dasuquin Chewable Tablets received an average rating of 4.7 stars out of 5 on Amazon at the time of this review. This clearly indicates a majority of customers were satisfied with the product and left positive reviews. According to most customers, the pros of the supplement greatly outweigh the cons. The product offers instant pain relief and reduces discomfort for dogs suffering from joint problems. Several pet owners agreed that the product increased their pet’s mobility after only a few days of use. 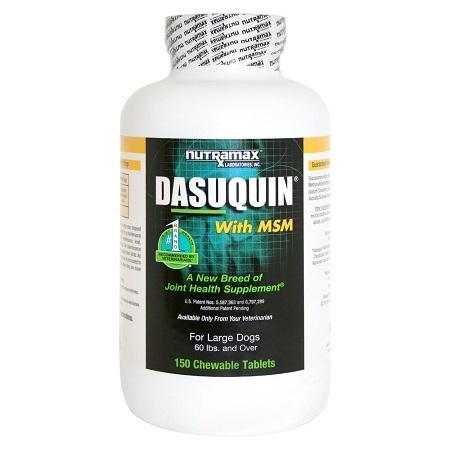 So, if your pet has trouble moving, Dasuquin could make a huge difference. A customer wrote their pet responded well to the tablet because of its great taste. On the downside, the supplement might not have similar results on all pet which is why you should carefully read the guidelines before investing in the product. Not all dog owners found Dasuquin effective for their pets. A few customers complained that the product caused their pets to start vomiting and initiated side effects, such as diarrhea. To avoid these problems, consult a vet before adding supplements to your dog’s diet. Also, avoid feeding your pet supplements if they are already on medication or suffer from another illness. Another common concern was that the tablet breaks quite easily, which doesn’t make it ‘chewy’ after all. Customers also complained the product is too expensive and not budget friendly. This especially becomes a problem if you simply want to sample it for your pet. Overall, the product received mostly positive reviews and it became apparent the supplements are especially beneficial for dog that suffer from mild to severe arthritis. Nutramax Dasuquin Chewable Tablets can be purchased on Amazon for just under $80 with free shipping on Amazon Prime. 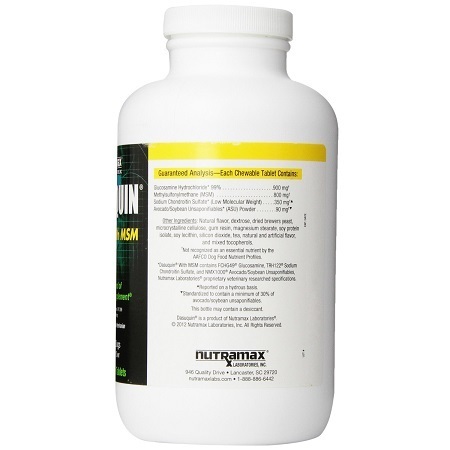 Customers can unlock 5% saving by subscribing to 5 bottles of Nutramax Dasuquin Chewable Tablets on Amazon. To save a few extra bucks, consider looking out for promotional offers, deals and discounts. Apart from Amazon, you can also purchase the product on eBay, Petco and other leading online stores. Apart from joint supplements, Nutramex offers a variety of other pet products that you are likely to benefit from. Overall, Nutramax Dasuquin Chewable Tablets is a great product that has been clinically proved to reduce joint pain and is especially beneficial for pets that suffer from arthritis. However, the product is quite expensive for a fairly small bottle, making it costly for most pet owners. Since, this is a supplement that you will be regularly feeding your pet, it might get a little too pricy in the long run. Consider looking for other medications and supplements if this one is too expensive. Additionally, to avoid the risks of side effects, consult a doctor before adding supplements to your dog’s diet and carefully read the instructions.